Soul Veg Mac n’ Cheeze–Plus Vegan Dad’s Southern BBQ Tofu! It’s hump day two-for-one! I’m crazy to give you two recipes in one day because I just realized that with our kitchen renovation, I’m losing the kitchen Friday-Tuesday or Wednesday which means no time to cook ahead for next week…BUT I’d already photographed this last week with the intention of a two-for-one, so here we go! What seems like forever ago, Laura of Abracapocus (and now owner Dough Bakery in Atlanta) posted a link to Eat Atlanta’s video of how to make Soul Veg’s uber famous mac n’ cheeze. Somehow, even though that mac n’ cheeze is my favorite dish in all of Atlanta and I miss it more than my mother (no offense, mom) I never actually watched the dang thing until last week. Seriously, who am I and what have I done with me? The video is a little long for my attention span (I’m not a vlog fan, in case anyone was wondering), I dutifully sat down with a pen and paper and recorded the recipe to try at home. While I seriously doubt any restaurant’s recipe when given in a video or in a magazine (I used to work for a bakery who, when asked by the Atlanta Journal-Constitution for their recipe gave the paper one that we never ever used and passed it off as the real deal), I figured it was worth a shot to see if I learned anything new with this one. I mean, vegan mac n’ cheeze. We’ve all been around that block a bajillion times, right? It’s pretty standard–nooch + non-dairy milk + mustard + a few other things–but it is pretty close to the authentic dish. The only issue I really had was that when I halved the recipe, I needed to use the whole amount of pasta or else I’d have ended up with pasta soup. Waaaay too much milk in that video, yo. As for Vegan Dad’s Super Easy Southern Tofu? Definitely a winner. The BBQ sauce is tangy and boozy and just the way I like my BBQ sauce to be and I liked the idea of adding a dry rub to the tofu, searing it, and then slathering it in sauce. Definitely adds another layer of spice. 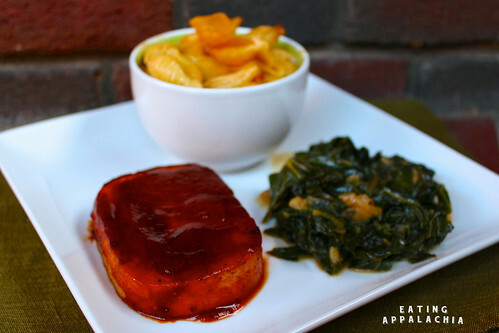 The tofu together with some mac n’ cheeze and my recipe for collard greens? Pure comfort food goodness on a plate. Blend together the soy milk, salt, garlic, mustard, paprika, and nutritional yeast until smooth. While the blender is running, slowly pour in the vegetable oil to form an emulsion. Mix the liquid into the pasta and transfer to an oven-safe baking casserole. Sprinkle the parsley on top and bake for 45 minutes. Slice the tofu into 8 even slices (about 1/2″ thick). Combine rub ingredients in a gallon Ziploc bag. Add the tofu to the bag and shake/roll around the bag in your hands to evenly coat each slice with the dry rub. Set aside. Heat oil on medium heat in large frying pan. Fry tofu for a few minutes on each side, until nicely browned. Add more oil, if needed. Remove from pan. Add Jack Daniels to pan and let reduce a bit. Add remaining ingredients and mix well. Bring to a simmer and let thicken for 12-15 minutes. Add tofu and turn to coat. That mac looks great, and I love that your mac doesn’t appear to be swimming in its sauce. My husband and daughter hate creamy sauces, even if they love how they taste. But OMG that is a lot of oil! Did it separate or give the mac a weird texture as it cooled? How does it hold up cold straight from the fridge? I didn’t notice any separation from the oil since it formed an emulsion. I think if you didn’t add it slowly while blending, then it’d be an issue. No weird texture either! But I think that’s because I didn’t use all the liquid the original recipe called for. As for out of the fridge–good, I think. I always heated it up though. It made so much I had to eat it for a week! LOVING your blog! I’m participating in VeganMoFo as well! Swing by when you can! This looks AWESOME! O.M.G. This looks freaking amazing! That’s a good looking Mac n’ Cheeze! You made a big casserole too – may I trouble you for a bowl? Oh, tofu! How I miss you! This looks so great, it’s making me want mac n cheese! God, I love Soul Veg’s mac and cheese so much! This whole plate. I haven’t actually tried all that many vegan mac and cheezes but this looks pretty fantastic. Extra props on the mini shell shape! Oh to be able to get collard greens in the UK. 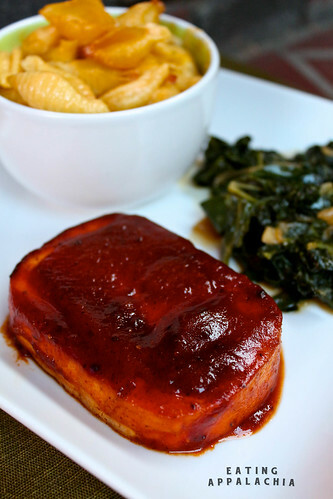 Alas, at least I can get the tofu – I love bbq tofu but have never made a boozy sauce. Will try this! That really does look like the most perfect comfort food, ever! My appreciation of nooch is growing so I will definitely be trying out the mac n cheese!